Once you learn how to weld, you can take metal matters into your own hands. 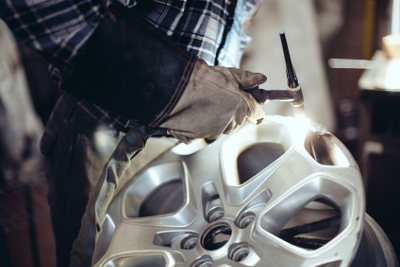 If you live in the Atlanta, GA area, no doubt the long, rainy summer months take their toll on your most trusted metal objects, namely your automobiles. Ride straight through those puddles with no worry about rust—that is, if you know how to weld. Armed with the best welding supplies like those available from Sidney Lee Welding Supply, you can learn to repair the rusty patches of your car before it becomes a clunker. And if you’ve bought your car secondhand from anywhere where snow is an additional factor, then you’re up against the salted roads that mean definite rust damage to sides and undercarriages. Still, no need to fear! Sidney Lee is here, and let’s get started on this DIY welding experience. First you’ll need to check on your supplies: with the right welding equipment in tow, you can begin to fix up your car today. For this kind of repair and maintenance work, you’ll need items like welding clamps, a hole punch, your favorite sanding machine, plasma cutter, and of course a MIG welding machine from Miller Welders. On top of that, once your weld is made, grab your favorite weldable primer and filler, and top it off with the right tone of paint to polish off your shiny auto exterior. After a thorough examination of your car from top to bottom, you’ll have an idea of what needs to be cut away. Power up that plasma cutter and excise the bad material, carefully and with precision. It can help to make a pattern from the metal that you will remove, with precise measurements to allow for simple replacement patching. That’s the point after all: getting rid of rust in order to weld some clean new material onto a strong foundation. It might take some grinding, if you are working on a car with a legacy of repairs under its belt—or hood, rather. It’s possible that your excavation will yield layers of material that no longer belong there. It can be quite a relief to dredge up stuff that weakens your car’s structure, grind it off, and replace it with new weldments. For seam welding, begin by clamping the metal to be welded in place, and tack it on with your MIG welder. Once the first row of tacking cools, repeat this process with intermediary tack welds around the patch. Of course this requires a certain expertise, so if you have any questions please don’t hesitate to give us a ring at the service center of your local Sidney Lee Welding Supply in the Atlanta, GA region.